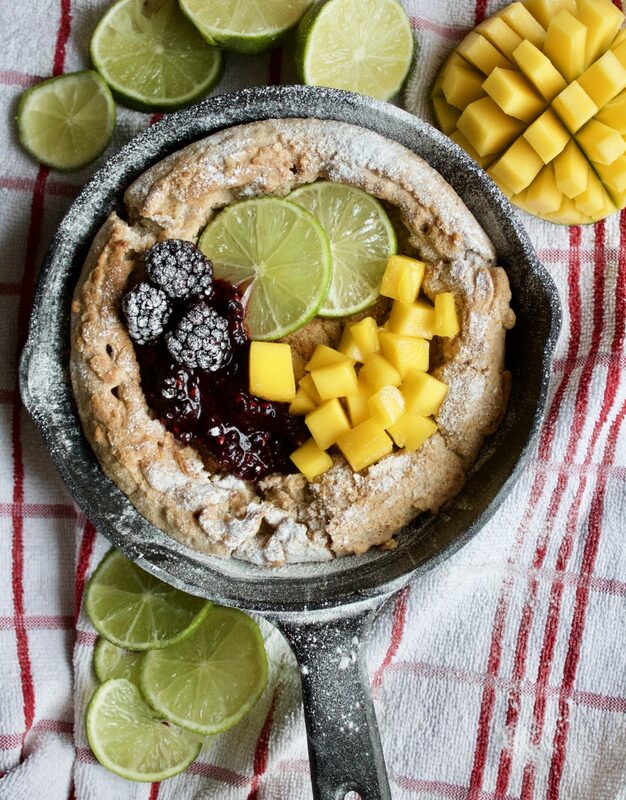 So, I took a bit of a risk with this recipe as this was the first time I had ever made a Dutch baby, let alone a “healthier” version of the original recipe. 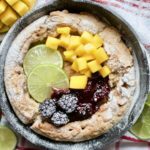 Well, my attempt was worth the risk as this tropical-infused Dutch baby was delicious! 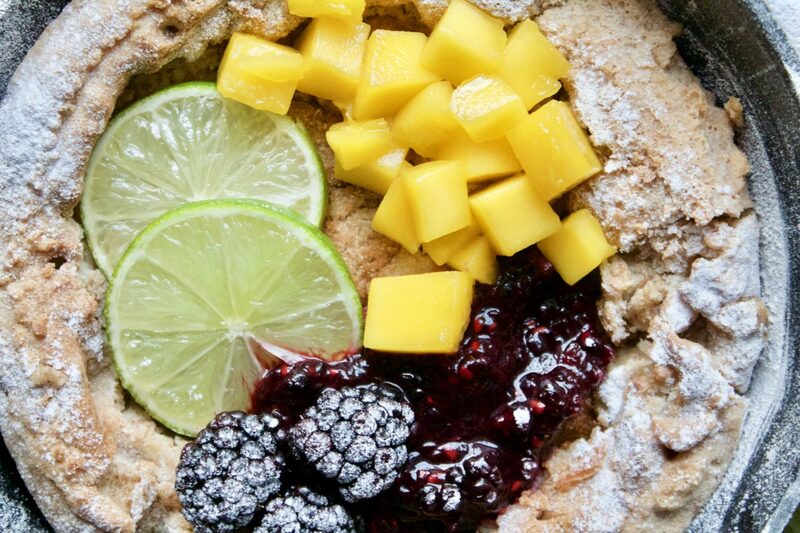 A Dutch baby is an American pancake normally served for breakfast. It is traditionally made with eggs, flour, sugar, milk, vanilla and cinnamon, usually with fruit added to the centre. 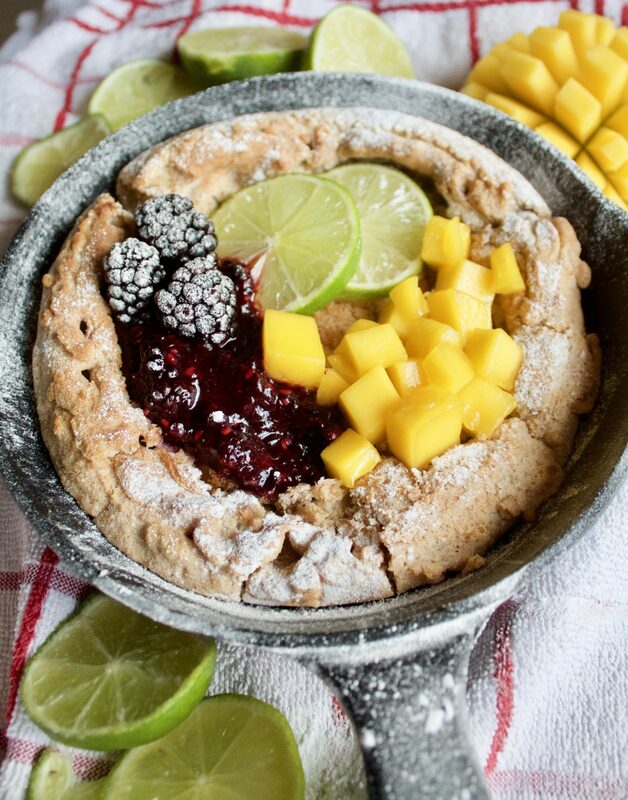 Every time I see a picture of a Dutch baby pop up on my Instagram feed, I am immediately intrigued! This dish is not the healthiest as it traditionally uses a lot of butter, a trans fat that contributes towards obesity and heart related diseases. 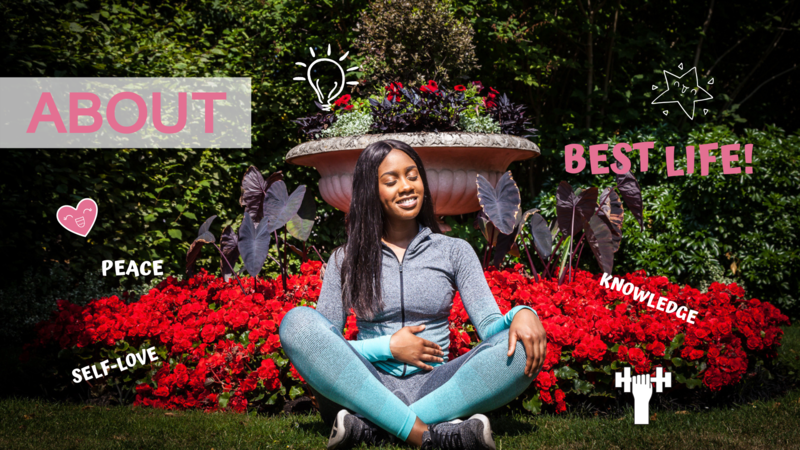 I decided to make this recipe more suitable to my diet by using coconut oil instead, a plant-based oil that converts bad cholesterol into good cholesterol. Overall, coconut oil is considered a healthier fat. I also decided to use wholewheat flour instead of plain white flour to add some extra fibre to the recipe. I didn’t add sugar to the batter as I saved the sugar element for the fruity toppings. To add some extra sweetness, you can use some maple syrup, honey or agave but remember to control your portion size. Finally, I used almond milk instead of dairy milk as it is lower in calories, better for my skin and delicious! 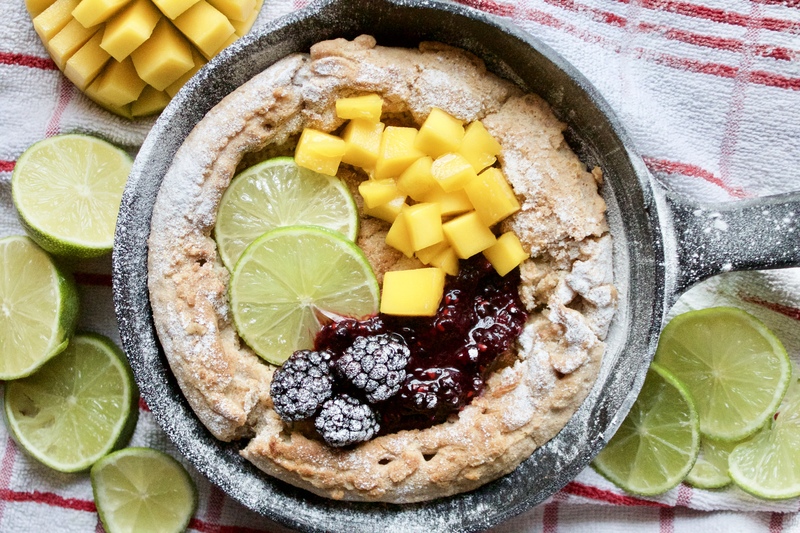 MANGO AND LIME WHOLEWHEAT DUTCH BABY! 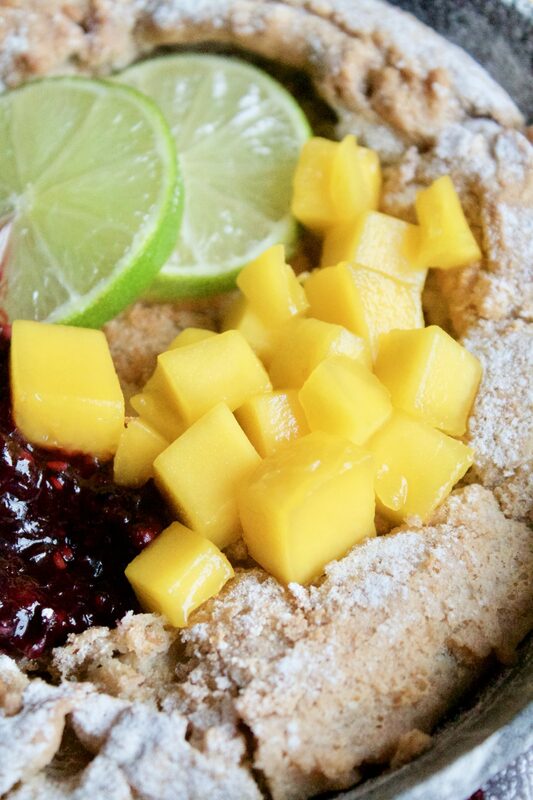 Preheat your oven to 220*C.
In a blender, add your eggs, flour, milk, vanilla extract, salt and lime zest. Combine until completely smooth. Heat your cast-iron skillet on a high flame and add your coconut oil. When the oil is hot, pour all your mixture into the centre of the pan. Make sure the mixture bubbles on the edges. Transfer straight to the oven and let it cook for 20-25 minutes. You will start to see the mixture rise and brown. When cooked, take out of the oven and let it cool so that the centre deflates a bit. Pulse your blackberries in a blender for 1-2 seconds until it forms a "coulis". 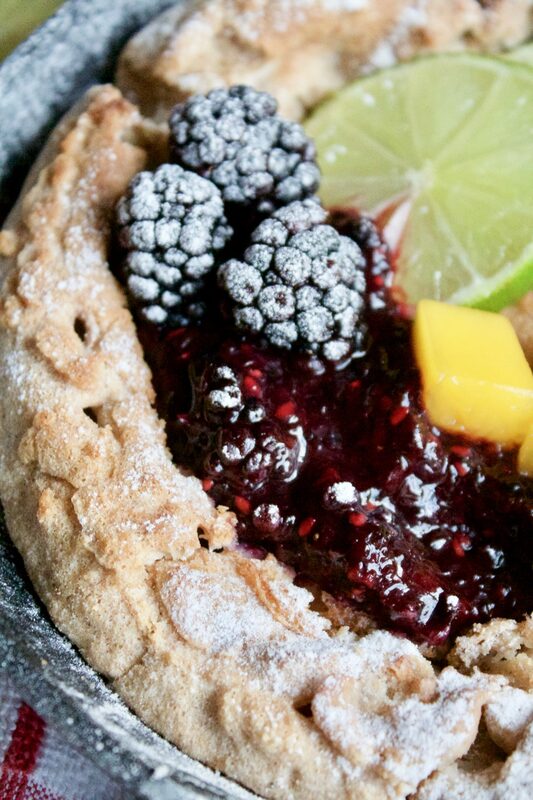 Add the rest of your toppings and drizzle on some honey/agave/maple syrup for added sweetness. Enjoy! I hope you liked this post and I hope you give this recipe a try! ⟵A LEAN BODY WORKOUT WITH SPEEDFLEX!